Pattern Cutter Laura Alice MacKay spoke to Utelier about what her role means to the fashion industry and how she helps young fashion designers. How do you explain what you do, to people in – and outside of – the fashion industry? I am a freelance pattern cutter, dressmaker and sample machinist. My job is – basically – to create the first garment from a design specification. The designer will decide on the shape and style of a garment, but they often do not know how to produce it, and that is where I come in. I will work with the designer to establish what is physically possible in terms of fit, size and measurements, and fabric limitations. Once the design is confirmed with a specification, I will start to produce a pattern. Depending on the size, I can either drape on a mannequin or alternatively draw a pattern out flat. Once I have finished the pattern, I cut it out of a simple fabric and sew it together as a garment called a toile. At this point, there will be a consultation with the designer, to see if they are still happy with the style and to check the fit. Changes are made at this stage. Sometimes a second toile is made if the garment has changed dramatically. Once the toile is confirmed final fabrics are selected, and final finishings such as hem and binding samples are made. The designer will select their favourite finishings and then I will make the sample in the final fabric. Why did you decide to become a pattern cutter? The fashion industry, in my opinion, is flooded with designers but there seems to be a serious shortage of people in the UK who can actually put garments together. When I was searching for a university course, I found that the places that only provided design tuition didn’t interest me as much as I had originally thought. I then stumbled across a course called Fashion Atelier, which was very technical. It taught pattern cutting and sewing at a high industry level. As soon as I enrolled in the course, I knew that was the path that I would definitely pursue. What essential skills do you need in order to become a pattern cutter – in terms of personal skills, and educational & specialist training? My brain works very visually and technically. I find it easier to explain myself by drawing diagrams rather than just talking and listening. So I would say a technical mind is needed in order to visualise how a garment will look eventually, even when it is just a flat drawing. I don’t think that I would have reached my level of skill without going to university – but that doesn’t mean that everyone has to go to university. Working freelance is quite hard in itself; you have to be on top of finding work and managing your workload effectively – you have to have a determined and motivated personality. Related reading: Should I have a Pattern Ready Before I contact a Factory? Do you specialise in a particular area? I specialise in womenswear, and in working with emerging fashion designers – they need guidance as well as patterns and samples. What were you surprised to learn about pattern cutting? Pattern cutting has limitations; fabric can only be made to sit in the way in which it wants to, and the body is made up of planes: areas with different curves or changes in direction. Something called “suppression” curves fabric around those planes. Examples of suppression include pleats, darts and gathers. I am always surprised when designers don’t know about suppression in pattern cutting. Their designs are often limited, or technically impossible to create and they don’t understand why. But, I am always happy to help them develop their designs with my technical knowledge. Why is it so vital for designers to employ a pattern cutter? Technology can do some pattern cutting – especially in terms of pattern grading – but it’s important to employ a pattern cutter because there’s greater scope for experimentation and design development with manual pattern cutting. In my opinion, design and pattern cutting go hand in hand. I think doing everything by computer takes an element of the design process away. I really like working with emerging designers – who often don’t quite know how they want their designs to be when finished – to further their ideas. My technical input is always greatly received, and I really enjoy seeing the finished garments, and how the design process has developed. What’s the biggest challenge that you face in your business? The biggest challenge I face is something which is both a blessing and a curse. In working with designers who need help developing, I get to be extremely involved in the whole creative process, which I absolutely love and wouldn’t change for the world. But on the flipside – a lot of the time – the designers don’t realise the time and energy that goes into pattern cutting and sample making. A lot of people want something for nothing and expect a high-end service, but do not want to pay for the privilege. I am very honest and open with my costs and put 100% into everything that I do. Young designers are always on a limited budget and despite how understanding I am – and the fact that I’m not actually driven by money – I find it difficult to manage demands for discounts. I am thinking about teaching one-to-one pattern cutting and industry-level sewing. I seriously think that there is a gap in the market for that sort of business. There are a lot of home sewing clubs and classes, but not many industry-level classes, other than at universities – which not everyone can afford. Also, many designers don’t have technical knowledge, and their designs can be limited without the understanding of what pattern cutting can achieve. So that is the next venture! 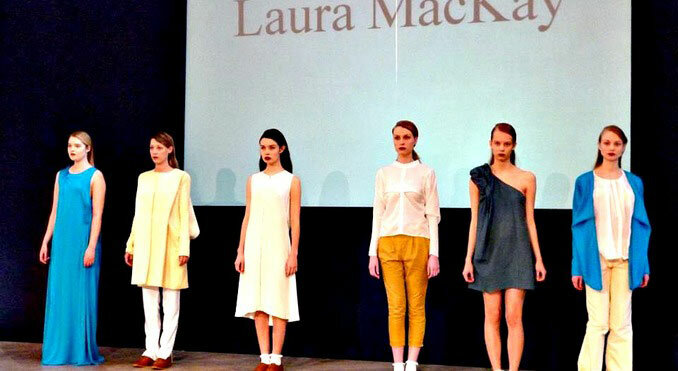 View Laura Alice MacKay’s portfolio and website.